Description: NS Eastbound Freight Train 66G at Irondale, Al. Description: NS Southbound Freight Train 339 rumbles through Livingston, Al. Description: NS Southbound Freight Train 339 roars through York, Al. Description: NS Southbound Freight Train 339 rumbles through Akron, Al. Description: Sitting in storage in East St. Louis. 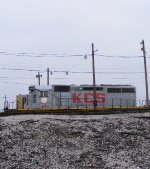 Title: KCS SD50's 7022, 7007. 7021 SD40-2's 3019, 646 sit on the north side of KCS Kendleton yard.